It might be winter, but that’s no reason to skip the beach! Visitors still enjoy everything that the sun and sand have to offer – even with the cooler temperatures. It’s always a good time in Orange Beach, Alabama, and we want you to come join the fun! With Valentine’s Day on the calendar, consider a romantic weekend getaway to your favorite Alabama beach rental. Rates are lower, crowds are smaller, and the sunsets (and sunrises) are just as beautiful. As in any season, fantastic restaurants and amazing shopping can be found at every turn. Round out your weekend with a private cruise with Sail Wild Hearts. Our sunset cruise is the perfect addition to your Valentine’s Day weekend. Bringing the family? We also offer great excursions such as our Family Adventure Sail. But don’t stop there! The good times start rolling on February 2 with Mardi Gras celebrations across the Gulf Coast. Fantastic, family-friendly parades are scheduled for Orange Beach. Catch all the moon pies your heart desires during the Mystical Order of Mirams Parade on Friday, March 1. Dance along with the marching bands and the Mystics of Pleasure on Saturday, March 2. 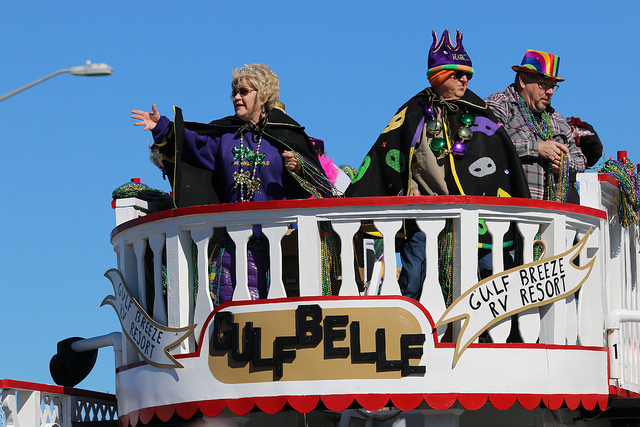 And don’t let Fat Tuesday (March 5) go by without soaking up the celebratory spirit of the Orange Beach Mardi Gras Parade. Grab a jacket and join the Carnival-season excitement with your friends at Sail Wild Hearts!